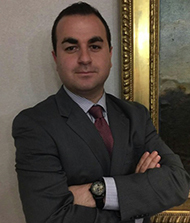 Samuel M. Boyamian rejoined my law firm in May of 2014 as a summer law clerk. He was admitted to the State Bar of California on December 1, 2017. Samuel is a recent graduate of Southwestern Law School. Samuel earned his Bachelor’s Degree in History/Law & Society with a Minor in International Relations from the University of California, Riverside. Prior to first joining my firm in 2011, Samuel worked for former bankruptcy judge Kathleen P. March assisting her firm with Chapter 7 and Chapter 13 bankruptcy cases. More recently, while in law school, Samuel served as a judicial extern to the Honorable Judge Barry Russell at the United States Bankruptcy Court, Central District of California. He is fluent in Armenian.